EVROSIMOVSKI Consulting is a company that offers business management consulting services, maintaining the leadership position in this field, through the realization and development of high quality and professional services. This company was one of the successful applicants to the Bitove Family Entrepreneurship Program, managed by Macedonia2025 in partnership with CESO. As such, Lynda J. Gibson – a proven expert with decades of global consulting experience was the second CESO Volunteer Advisor coming to Macedonia, doing her assignment at EVROSIMOVSKI Consulting – Skopje, thus assisting the growth of the firm on the international consulting market. In an interview for Macedonia2025, Gibson and Evrosimovski reveal how their applied for the program and what are the main benefits and expectations on the long run. Could you both tell us something more about yourselves? Gibson: I am a career management consultant from Vancouver British Columbia. I worked for several boutique specialized consulting similar to EVROSIMOVSKI Consulting before joining a global firm, Deloitte & Touche. I have never been to Macedonia but did do an assignment in Romania. That was a long time ago and I was thrilled to hear about CESO’s focus on Macedonia – I jumped at the chance to participate! Evrosimovski: I am the Manager and CEO of EVROSIMOVSKI Consulting. I have founded EVROSIMOVSKI Consulting in 2006, since then I am in charge of planning, organizing, coordinating and operation control of all the necessary activities regarding to defining, establishing and managing of EVROSIMOVSKI Consulting. Mr. Evrosimovski, why did you decide to choose Lynda J. Gibson as a CESO Volunteer Advisor in your company? What prompted you to apply and where did you see the need of having an external consultancy in your company? Evrosimovski: When we were making the choice about the most appropriate CESO Volunteer Advisor for our company we were detailly comparing the consultants’ profile with our needs and expectations. We were pleased to see that we received interest for offering advisory services from an experienced expert such as Mrs. Gibson. Her resume was more than impressive for us and we were happy to know that we can collaborate with her. The engagement that Mrs. Gibson had in world-known, successful consultancy companies that are in similar field as ours, made us hopeful that we can have the opportunity to be consulted from an experienced professional. We saw the need of having an external consultancy in our company when we were defining our future goals for the company. One of our main goal is to increase the number of clients, to adjust and improve our business, marketing and sales strategy, and also to penetrate the foreign market. Considering our needs, we decided that the best advisory for reaching our goals could be given by an external consultant with international experience. The other point that was important for us was the idea of having brainstorming meetings with an expert that can influence the way that we manage, organize and plan our business activities. Mrs. Gibson, as a person coming from Canada, what are your first impressions from Macedonia? How did you adapt to the existing working culture? Gibson: Macedonia is a real gem. The geography, the people, the culture are enchanting. Much of the business of professional services are the same in Macedonia as the rest of Europe and so there was not much need to adapt. The major issue for me was to understand why breakfast is at 10 or 11 am and lunch is mid-afternoon! Mr. Evrosimovski, in which aspects from your work is the CESO Volunteer Advisor mostly included? Evrosimovski: As mentioned, the CESO Volunteer Advisor was mostly included in re-defining our business plan for the next period regarding the re-organizing of our strategy, our approach to the market and analyzing the possibilities for improvement. How would the Bitove Family Entrepreneurship program sponsored by the Bitove Family Foundation, in alliance with CESO and Macedonia2025, affect the company’s competitiveness? What are the main benefits? Gibson: The company is already very competitive thanks to its current leadership. We were able to develop a low risk plan that will allow it to expand in Macedonia and to become a unique professional services firm that supports clients across the Balkans. Evrosimovski: We believe that the company’s competitiveness will be affected in a good way. What are the expectations on the long run? Evrosimovski: On the long run we expect to achieve the results and reach the goals. After finishing all the phases of her engagement we prepared together a valuable plan that we tend to follow. The communication and collaboration was based on exchanging ideas and information, so therefore the conclusions of our work are realistic and achievable. Gibson: I would expect that in the next 3 years the company is two to three times its current size in terms of people and revenue. 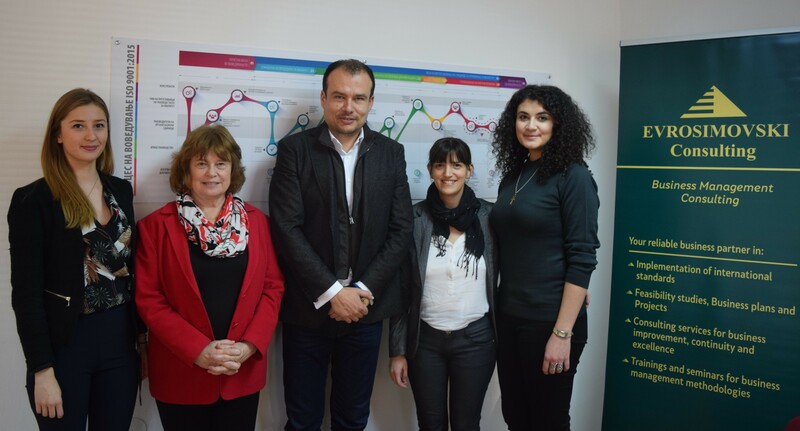 Why should other Macedonian companies apply to the Bitove Family Entrepreneurship Program? Evrosimovski: The Bitove Family Entrepreneurship Program is a great program that can bring benefits for the companies in Macedonia. The opportunity that the program gives to the companies and their management is of great value. We believe that the companies in the region, like ours, have great potential, skills, human resources and can therefore achieve much more after getting advisory from the experts that contribute to the program. The network of CESO Volunteer Advisors that the program is working with is composed of high-profile experts from many fields with much experience in many fields of work. The other very important benefit from the program is that the vision for extending the market for offering services internationally can get realistic advice and guidelines from an expert whose knowledge is very relevant. We advise other companies to extend their boundaries and allow themselves to explore the true potential of their business by using the Bitove Family Entrepreneurship Program. Gibson: This is an amazing opportunity to work as a partner on a 1-1 basis with willing and ambitious SME leaders in a country that has everything in place to grow and expand opportunities within the EU.